In order to ring-fence the independence of Russia’s MC-21 aircraft programme from the uncertain availability of foreign-manufactured items, the Russian aerospace industry has successfully designed its own replacement parts for the advanced narrow-body aircraft’s composite centre-wing and wing box sections, Russia’s vice-premier Yury Borisov has revealed to Kommersant business daily. Those parts were originally constructed from imported composite materials, deliveries of which were stopped after the USA imposed sanctions against Russian company Aerocomposite. Along with this, United Aircraft Corporation (UAC), the parent company of MC-21 manufacturer Irkut, is also planning to invest some 35 billion roubles in the creation of a stock inventory of those components that are currently made outside Russia. These decisions have been taken to protect the programme from further risks. With the Russian industry designing its own replacement components, the foreign-made parts will gradually be entirely phased out from the project. The first problems with the deliveries of composites occurred in September 2018, when the USA imposed sanctions against Russian producers, namely Aerocomposite (part of UAC) and ONPP Tekhnologiya (part of Rostec), an action that prevented the USA’s Hexcel and Japan’s Toray from supplying composite material for the MC-21. The timetable for the phasing out of all imported components will continue until the end of 2020 and will proceed in parallel with the certification of the base version of the MC-21. 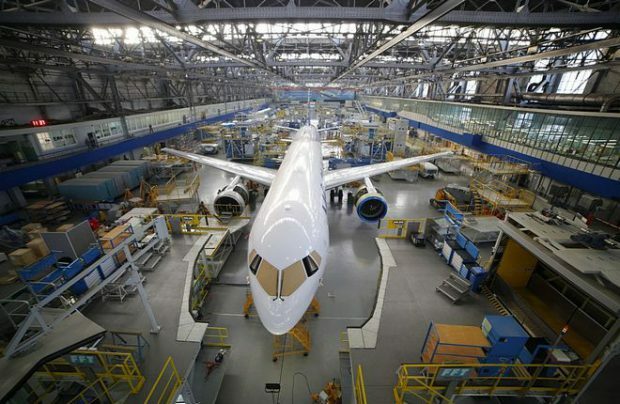 Representatives of both the industry and the government have previously announced that Irkutsk Aviation Plant, which is part of Irkut, will be ready to launch serial production of the new airliner in 2021, several years later than originally planned. A third MC-21 prototype joined the flight test programme on March 16. To prevent further delays, the industry is taking additional protective measures, a source has further revealed. In an optimistic scenario the first MC-21 deliveries will occur in 2021 with locally produced wing and tail assemblies, but still fitted with a number of imported systems that are not yet under sanction, he says. “These systems will also eventually be phased out and replaced with domestic products. Anything can happen in the meantime – perhaps further sanctions could be imposed – so the suggested solution to that is to create a reserve stock of foreign-made components,” the source adds. At the end of 2018, contracts were signed for five serial aircraft kits but, to mitigate the risks of delivery disruptions, UAC has made the decision to contract a further 20. “In any case, this [additional supply] will last for about two and a half years of serial production,” the source adds. Such stock will cost more than 35 billion roubles, of which some five billion must be allocated in 2019, 16.4 million in 2020 and 14 billion in 2021. According to UAC, MC-21’s backlog currently includes 175 firm orders, of which 85 are contracted by Avia Capital Services (Rostec’s leasing subsidiary) with 50 of them intended for Aeroflot, a further 50 by Ilyushin Finance Company, 30 by VEB Leasing and 10 from IrAero Airlines.